Home Science for Kids Planet Earth for Kids Deception and Mimicry Among Animals to Fool Enemies! 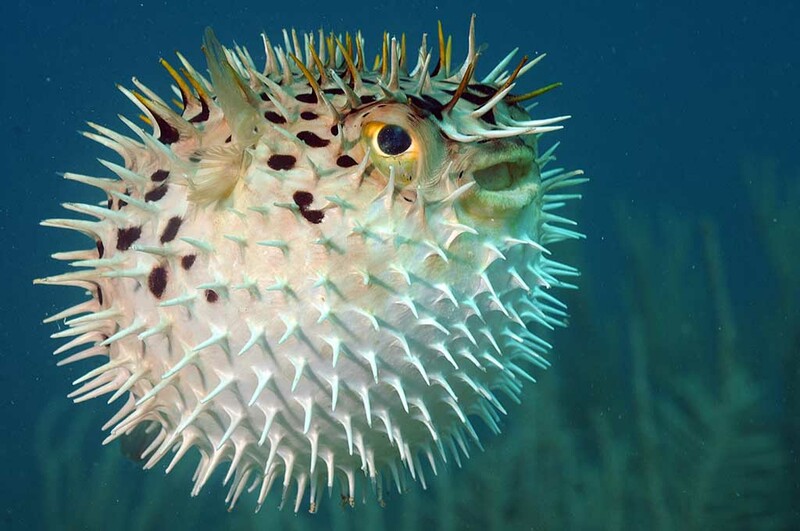 Puffer fish can take in large amounts of water to swell up like a balloon making it very difficult for its attacker to swallow it. Deception and Mimicry Among Animals to Fool Enemies! All living beings have enemies. And they all have developed interesting ways to keep them at bay. Some animals hide, others run, or just fly away when faced with danger. These are their defence mechanisms. Some animals can hide without moving. They have the unique ability to change their colour to merge with the surroundings. They become invisible to the predator. This method of defence is called “camouflage”. Some rabbits change colour with the change of season. The snowshoe hare is brown in summer and white in winter. The white fur serves as a camouflage in the snow in winter. Many non-poisonous snakes take on colours similar to poisonous snakes in order to scare off enemies. This form of defence is called mimicry. Some poisonous snakes have very bright colours to warn enemies that it is near. This form of defence is called “warning colouration”. Fishes use another form of camouflage called counter-shading. The underside of most fishes is of a lighter shade than the top. The deeper colour on the top helps it merge with the shadows it makes. There is a kind of fish called the puffer fish which uses an extraordinary device to keep predators away. It swells up like a balloon when it is attacked. Then, its attacker finds it difficult to swallow it. Animals which cannot protect themselves in these ways develop other means to do so. Some have claws and teeth which they use to fight, others have poison fangs. Snakes bite, bees sting and skunks squirt an unpleasant smelling liquid to ward off enemies. And then there are animals like the porcupine, whose body is designed to defend itself. It has quills all over its body which could injure an enemy. Like animals, plants too have interesting ways of protecting themselves. But, they have a disadvantage. They cannot move. So, the cactus has developed long spines instead of leaves. These spines act as thorns and prick anyone trying to eat it. Vines have thorns to keep animals away. Some plants have poison, which could be harmful to a predator.